For today’s post we travel back through the archives to December 2009 on a quick trip I made to Boston. This image features a few buildings…one of which is among my favorites in the Financial District. 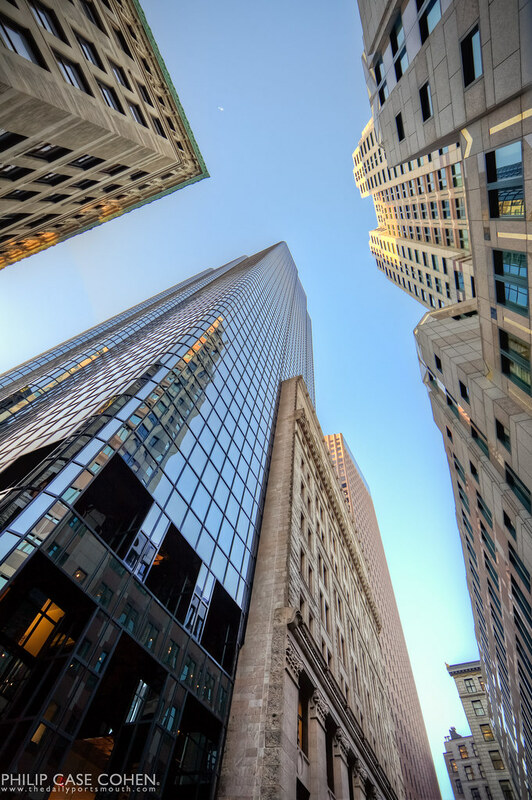 Exchange Place is a glassy structure that rises out of the 12-story Boston Stock Exchange, a classic Boston piece of architecture originally constructed in 1896 and redeveloped in 1985 to feature the glass tower. What I like about the building (and I’m sure others hate), is the fact that the original structure is still standing and compliments the new addition, bringing a nice blend of the modern and the historic character of the area. I love the way the structure captures the light around it and reflects neighboring buildings. Totally agree with you Phil – it is a nice blend of old and new, and a nice way to capture it! Well done! If you like the blend of old and new then I also recommend checking out the reflection of the old church in Copley Square on to the glass of the John Hancock building. That, in my opinion, epitomizes Boston.